How does a police department lose a Humvee? One freezing day last November in the tiny town of Palestine, Ark., a young man named Jamie Hart climbed into the police department’s Humvee, turned it on, and drove off on a joy ride. The 28-year-old spun the military vehicle around in donuts outside his house on Thanksgiving Day, according to a neighbor. “It never crossed my mind” that anyone would do that, Palestine Police Chief Stanley Barnes said Wednesday of the incident. The Humvee, which the town of fewer than 700 people got for free through a controversial Pentagon program that gives old military equipment to local police departments, doesn’t have keys. But it’s easy to look up how to start one. The possibility that the 5,000-pound Humvee might be stolen was so far from Barnes’ mind that it took a week before anyone on the small force noticed it was missing from the police station’s parking lot. Once Barnes noticed it was gone, he sprang into action. A hunter reported seeing the vehicle, which was emblazoned with the police department’s logo, in the woods a county over. The thief had driven into a tree and completely wrecked it. Barnes sent a truck over to pick up the Humvee and tow it back to the station. The police department now uses the massive wreck for parts for its other Humvee, which it also obtained from the Department of Defense Excess Property Program (DOD 1033) to help fight crime in the small town. As odd as it may seem that a hulking armored personnel carrier could go missing from a police department, it’s not that uncommon an occurrence. In fact, at least three other police stations have misplaced or been robbed of their government-issued Humvees in the past five years. Weapons turn up missing, too. Yahoo News found that local police departments like Palestine's have been suspended from the Pentagon 1033 program for misplacing at least 14 M16 assault rifles, 11 M14 assault rifles, 21 pistols and 10 shotguns. These figures don’t come close to representing the total number of weapons that have been stolen or lost over the life of the program, however — a figure the Defense Department has not released. In the wake of the controversy over the military-style police response to protests in Ferguson, Mo., President Barack Obama has announced that the White House is conducting a review of the 1033 program, to ensure it’s using taxpayer money wisely and is not giving police departments equipment they don’t need or shouldn’t have. A Senate committee will also examine the program in a hearing on Sept. 9. Among the problems that Obama is likely to find is that the program lacks oversight and accountability. 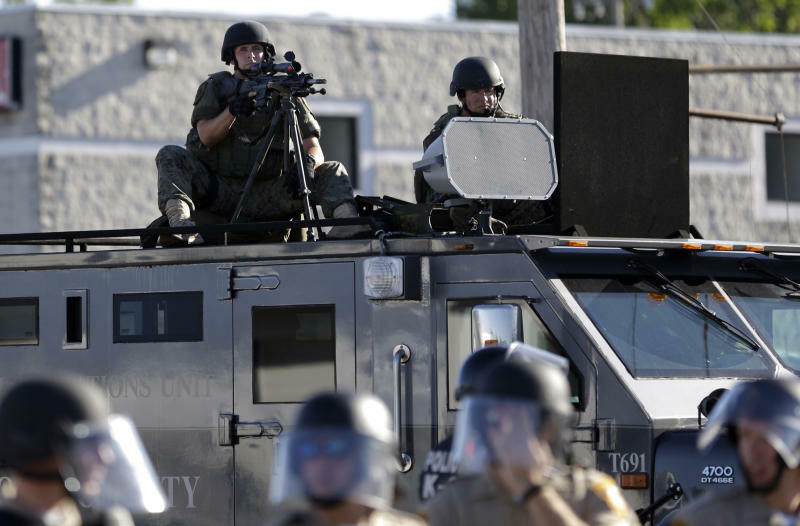 Once Pentagon weapons reach the 8,000 police departments — many of them in tiny towns — that participate in the program, the federal government has little control over them. The departments are not allowed to sell or dispose of any of the 1033 “controlled” items, which include small arms and tactical vehicles. An agency in each state takes over responsibility for checking the inventory once a year and reporting anything missing to the Defense Department’s Defense Logistics Agency. But penalties for disappearing equipment are minimal. Police departments that lose assault rifles are not allowed to get any new gear from the program but are not required to return any of the equipment they have already received. Sheriff Joe Arpaio of Maricopa County, Ariz., for example, can keep the 89 M16s he got through the program, even though his department was suspended in 2012 after he lost one of those rifles along with nine Colt .45 handguns. Losing a weapon or vehicle, even something as big and expensive as a Humvee, does not mean a police department will be automatically excluded from getting more free military equipment. If departments report the equipment missing within 24 hours, they can avoid suspension entirely. The sheriff’s department in St. Francois County, Mo., has not been suspended from the program even though a man stole its 1990 Humvee in May and went on a crime spree in it, robbing a convenience store before he was finally apprehended in St. Louis County. And suspensions can be lifted fairly easily. The police department in Meridian, Miss., signed a “corrective action plan” letter promising to keep tighter control over its loaned weapons last March after it lost four M14 assault rifles from its arsenal; the letter will most likely result in its reinstatement. Meanwhile, Sheriff Tom Jones of Grant County, Wash., said he expects to be reinstated in the program after the Washington State Patrol finishes investigating the disappearance of one of its government-issued M16 assault rifles. “One of my chief deputies is overseeing getting back on the roster,” he said. The program has also been a magnet for fraud. The police chief of Rising Star, Texas, William Jason Kelcy, was indicted in February on charges of illegally pawning and bartering more than $4 million of equipment he got from the program, including a machine gun. (Kelcy died before his trial took place.) Meanwhile, a police officer in Columbus, Ohio, was sentenced to two years in prison for selling federal 1033 equipment for profit in 2012. A municipal audit in Nashville, Tenn., in 2008 found more than $130,000 of the federal property missing and blamed a city official for its misuse. “There is a big difference between our military and our local law enforcement, and we don't want those lines blurred,” Obama said last month. The president is ordering his staff to review the program to “ensure that ultimately these local law enforcement organizations and the Department of Defense are being good stewards of taxpayer dollars,” Press Secretary Josh Earnest said last week. The review will ask if the police departments are properly trained to use the equipment they’re getting, and if they need the gear in the first place. Weapons make up just 5 percent of the equipment given out through the Pentagon program, and tactical vehicles like the Humvee Palestine lost make up less than 1 percent of the gear. Computers, sleeping bags, office furniture and other excess items account for the rest of the local windfall. Police supporters argue that the free equipment helps them fight crime in an era of shrinking municipal budgets, and that it would be a waste to destroy vehicles and weapons the military no longer needs but has already paid for. Local police are responsible for paying for maintenance and training. Yahoo News contacted the 35 states with police departments that have been suspended by the Pentagon over the past five years. Just 18 of the states responded with what equipment, if any, was missing in those law enforcement agencies that caused the suspensions. The Defense Department won’t release a full list of missing equipment nationwide, so it’s impossible to know the full scope of the problem. It relies on state coordinators to ensure departments aren’t misusing or misplacing things, according to Defense Department spokesman Mark Wright. “We’ve got some people … that run this program, but there’s no way we can keep track of 8,000 different agencies,” Wright said. — Katie Bindley contributed to this report. Correction: An earlier version of this article incorrectly referred to certain rifles as semi-automatic. This story has been updated to reflect new details found in a police report on the stolen Humvee.